I love words, I love stories, I love books. A perfect Saturday for me is one with ample time under a blanket, with a warm drink and a good book. But I am a WIMP. I cannot stomach anything gory or scary. If it is graphic or tense, I will pass, thank you. Fiction-wise, I mostly read youth fiction, because grown up books are too scary for me. 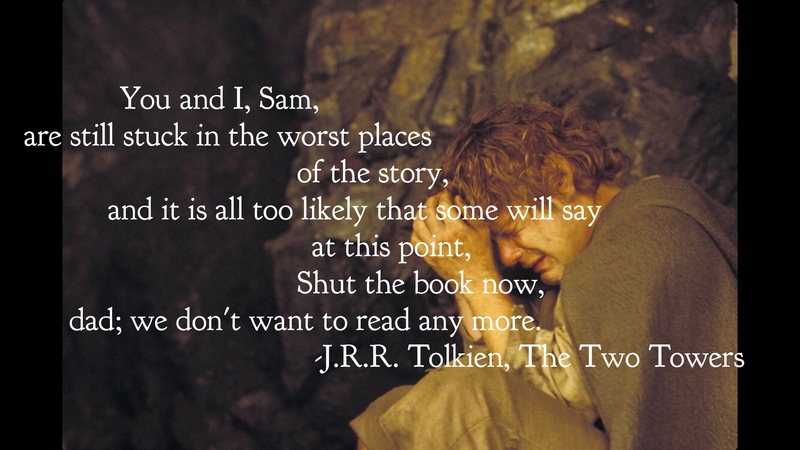 The only reason I made it through many of my favorite books is that the tension is a slow boil. The Lord of the Rings starts with the beauty and peace of the Shire, and I’m thoroughly attached to Frodo and friends well before they get anywhere near Mordor. Hogwarts only holds minor danger for anyone until the 4th book. The only reason I made it to the end of Harry Potter and the Deathly Hollows was that I had to find out what happened to Harry and his friends, characters I’d spent years with and thought of as friends. And I cried my eyes out through every death, creature and human, cursing JK Rowling for breaking my heart. Confession: Because of this, I read the end of books. Yes, I am one of those people.I read half-way through a book, get really attached and nervous about the characters, jump to the last 2 pages to ease my mind, then go back and read the whole book. I just get so nervous when I get to the scary parts of a story. I have to know how it fits into the bigger picture before I can go on. I have to know that everything is going to be OK.
I’m like this in real life also. Sometimes life is HARD. Sometimes I get really discouraged, and scared, and think that if this is how the story ends, I just CAN’T. This is one reason I love the Bible. It reminds me that the story I find myself in is not the main story. And promise after promise holds out the hope that wherever I find myself, it is just a chapter in a bigger story. I just love these words, this truth, this reminder that there is more going on that what my eyes can see. And when I get really discouraged, buried in my current chapter, I can always turn to the very end of the story. If our eyes are open, we see sadness, sorrow and suffering all around. Selfishness, unkindness, even terror and horror. I would never read this book. But this is just a chapter, not the end of the story. Be encouraged with me, friends. This is a GOOD story, and it has a GOOD ending. There is more going on than what our eyes can see.